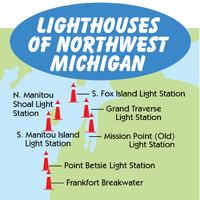 Many harbor towns long Lake Michigan are proud of their lighthouses, and Manitowoc is no different. 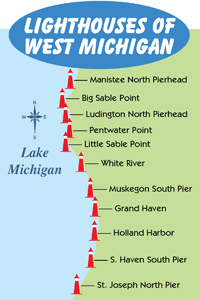 It's the first structure you see as you enter the harbor, as does the S.S. Badger carferry...which sails from Ludington, Michigan to Manitowoc, Wisconsin every May-October. 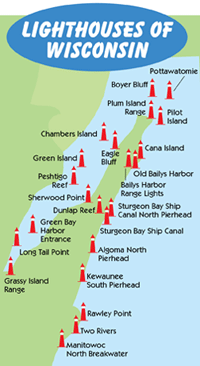 The Manitowoc Breakwater Light, located at the mouth of the Manitowoc River, is a 52 foot steel tower set upon a 22 foot by 48 foot concrete base. 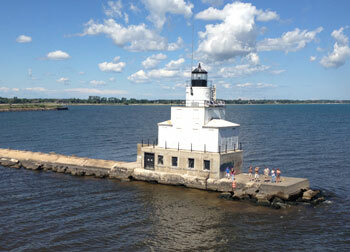 The present light was built in 1918, replacing earlier lights built in 1840 and 1895. The lens now used is a Fifth Order Fresnel, which replaced the Fourth Order Fresnel from 1918. The town of Manitowoc, from the Native American word Manidoowaak meaning "dwelling of the spirit," was founded in 1836. Because the river was of a good size, it was recommended that a lighthouse be erected. With an appropriation from Congress of $5,000, a white brick tower was built in 1839 at the corner of York and 5th streets. It measured thirty feet tall but with its location on a hill, its lamps had a focal plane of sixty-three feet. A white brick keeper's quarters was also built, measuring 34 feet by 24 feet. Then in 1850, a wood pyramidal tower was built on the outer end of the north pier along with a catwalk. It was eventually destroyed during a storm in 1937 and replaced with a skeletal tower. The original brick light was demolished in 1895 due to the need for extensive repairs. At this time a 400 foot long breakwater was built off the northern pier, as well as a fog signal building at the southeast end of the breakwater, which was covered with corrugated iron. 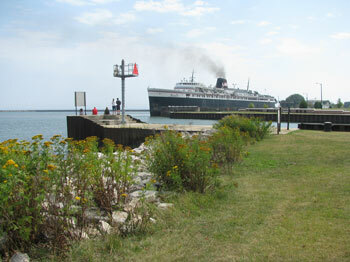 The harbor was extremely busy during this time, due to the car ferries that transported 27,000 railroad cars across Lake Michigan. In 1912, it was determined that a new fog signal building be constructed, in part because the old building was moved twice. In 1918, the current steel lighthouse was built, and a temporary oil light was placed in the tower's decagonal lantern room. After additional funding, a diaphone fog signal and electric light were installed in 1919. The fog signal was replaced by an electronic foghorn in 1964 was automated in 1971. 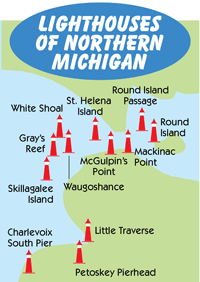 Today the lighthouse aids in navigation to boaters in Lake Michigan, but it is not open to the public.